Yes, as long as there are adequate class room and welfare facilities available. Plus space for delegates to practice and train with vehicles in Banksman Safety Signals. Nearly a quarter of all deaths involving vehicles at work occur during reversing without Vehicle banksman Many other reversing accidents do not result in injury but cause costly damage to vehicles, equipment and premises. Every year Vehicle banksmen suffer serious and fatal injuries whilst at work. If you do use Vehicle banksmen, then make sure they are trained to carry out their duties safely. There must be a safe system of work that ensures the Vehicle Banksman and driver are using standard signals, so that they are easily understood, and that the driver knows to stop the vehicle immediately if the Vehicle Banksman disappears from view. 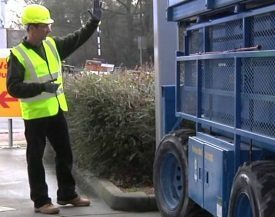 Our on-site Vehicle Banksman training aims to raise awareness of the dangers caused when large vehicles reverse, and introduces practical Hse approved techniques and hand signals to assist drivers with this manoeuvre. Get Qualified, Stay Qualified, standard and bespoke training courses available either on site or at our training centre, call now, 01282 504455. Banksman health and Safety construction training. Maximum of 10 delegates per course at £350.00 per course throughout the uk or £275.00 at our Nelson Training Centre.